It should be simple: Charge phone overnight, wake up with enough battery to last the day; repeat. Nope. Try more like: Get home way too late, pass out, press snooze 748 times the next morning and get to work at 9:02 either with no phone at all or one whose battery now has about 20 precarious minutes of juice left before dying yet again. If the latter sounds like you (it is certainly me) you may consider picking up a Power Pen, a ballpoint pen/stylus/portable charger three-way gizmo. It has a 700mAh built-in battery, so about enough to charge your smartphone a third of the way—not a lot, but certainly enough for an emergency top-off. It works with any Apple or Android device with a microUSB or lightning port, so phones, tablets, e-readers, speakers and other gadgets. Sold. Though it's worth noting the Power Pen it's just the latest in a slew of mini-chargers—like the perfectly tiny inCharge cable currently making its way through Kickstarter—designed for irresponsible folks like myself that can't seem to pull it together enough to keep a device powered up for a whole straight day or throw a regular charger cable in a bag. But this one has a gimmick: It doubles as a writing utensil, in case you a) still write things by hand and b) have also misplaced that. Which let's face it you probably have. 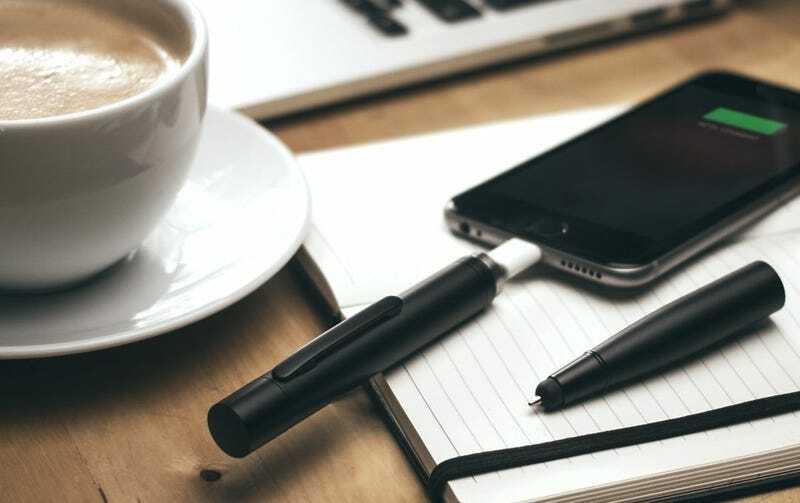 You can preorder the Power Pen for $40 from Firebox; it ships out Dec. 29.